The Services Communication sample demonstrates how to establish communication between an RO SDK server application and a Hydra SDK plugin. You will learn how to share a session managed between server and plugin, but the same techniques can be used for similar tasks. Please note that you will need to have the RO SDK for Delphi and the Hydra RO SDK integration package installed in order to build and run this application. 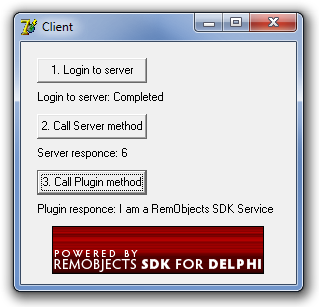 The server application is a regular RemObjects SDK VCL server application that exposes two services - a simple test service and a login service. If you need more information on how to create an RO SDK server, please refer to the RemObjects SDK docs. FormCreate method - Using module manager, we can load all existing dll's in the server directory and activate our server. OnGetRODLReader event handler - Assigns Hydra's THYRODLReader component as a custom RODL reader. This component allows our server to merge RODLs from plugins into the main RODL. The ServerInterfaces.pas file holds a definition of our custom interface and is shared between the server and the plugin. This interface is implemented by our server and will allow the plugin to get access to the server session manager. Our server contains two services: One is a regular test service that is added by the SDK wizard. This service is set up to check for a valid session to be able to perform client calls. 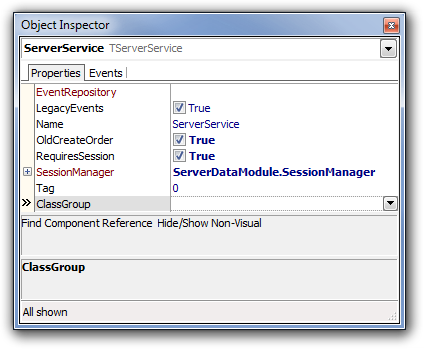 To do this, we've set the RequiresSession property to true and assigned a session manager that is located in the server's data module. The second service is a login service that allows the client application to authorize itself and register sessions. As you can see, it simply compares the user name and password, and if they match, it creates a new session. Like the sample service in the server, it requires a user session to be able to process client calls. In order to do this, we can use our custom interface to communicate with the server application. Unlike regular Hydra plugins, the RO SDK plugins do not have a Host property, so in order to access the host, we need to use our module controller. The module controller is a singleton object that is created when the plugin is loaded by the host so you can use to get access to the host instance. The Supports method checks if the Host implements the interface, and if it does, it will assign a reference to the Provider variable that we declared above. Now we can set the SessionManager property and our service is ready to process client calls.